Have you recently purchased a tablet or a newer laptop or MacBook, and you can’t connect to your HDMI® or VGA display, or even connect to a wired network? The slim and compact design of Ultrabooks, tablets and laptops only allows enough room for Mini DisplayPort and USB ports. 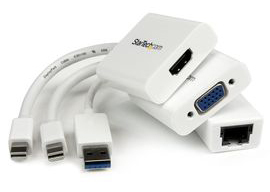 Our kits restore essential connectivity by providing HDMI, VGA and Gigabit Ethernet connections when you need them.